In the tradition of modern classics The Dinner and A Gentleman in Moscow comes The Waiter, in which the finely-tuned balance of a grand European restaurant (that has seen better days) is irrevocably upset by an unexpected guest.In a centuries-old European restaurant called The Hills, a middle-aged waiter takes pride in the unchangeable aspects of his job: the well-worn waiter uniform, the ragged but solid tablecloths, and the regular diners. Some are there daily, like Graham “Le Gris”—also known as The Pig—and his dignified group of aesthetes; the slightly more free spirited drinking company around Tom Sellers; and the closest one can get to personal friends of the waiter, Edgar and his young daughter Anna. In this universe unto itself, there is scarcely any contact between the tables…until a beautiful and well-groomed young woman walks through the door and upsets the delicate balance of the restaurant and all it has come to represent… Imbued with the dreamy, quirky, fable-like atmosphere of a Wes Anderson film, the sophisticated and philosophical nuance of Muriel Barbery’s worldwide sensation The Elegance of the Hedgehog, and the nostalgic and gimlet-eyed observation of Amor Towles’s bestseller A Gentleman in Moscow, The Waiter marks the North American debut of an exciting new voice in literary fiction. In the tradition of modern classics The Dinner and A Gentleman in Moscow comes The Waiter, in which the finely-tuned balance of a grand European restaurant (that has seen better days) is irrevocably upset by an unexpected guest. 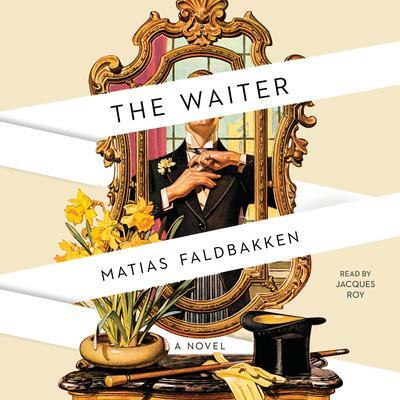 In a centuries-old European restaurant called The Hills, a middle-aged waiter takes pride in the unchangeable aspects of his job: the well-worn waiter uniform, the ragged but solid tablecloths, and the regular diners. Some are there daily, like Graham “Le Gris”—also known as The Pig—and his dignified group of aesthetes; the slightly more free spirited drinking company around Tom Sellers; and the closest one can get to personal friends of the waiter, Edgar and his young daughter Anna. Imbued with the dreamy, quirky, fable-like atmosphere of a Wes Anderson film, the sophisticated and philosophical nuance of Muriel Barbery’s worldwide sensation The Elegance of the Hedgehog, and the nostalgic and gimlet-eyed observation of Amor Towles’s bestseller A Gentleman in Moscow, The Waiter marks the North American debut of an exciting new voice in literary fiction. Matias Faldbakken is a world-renowned contemporary artist and writer who shows with the Paula Cooper Gallery in New York and has been hailed as one of the freshest new voices to emerge in Norwegian literature during the past decade. The Waiter is his first novel in several years and the very first he has written under his own name.